The new foot-shaped last and inner midfoot wrap make running at top speed in the Streak 6 very comfortable, according to most reviews. It is a very light racer. Several reviewers noted that the price tag is very acceptable for a versatile racing flat. A handful noted that there is a much better responsiveness in the latest version of the Zoom Streak. Though designed as a racing flat, a good number of comments mentioned that the shoe can also be used for high-mileage runs. The arch support is better in this version of the Nike Streak. Some runners noted the dependable traction of the Zoom Streak 6. The breathability is first-rate, as cited in many of the reviews. A good number of remarks pointed out that it is half a size smaller than standard. A few stated that it is just a bit too firm than what they are accustomed to in the Streak series. A significant number of runners were disappointed with the shoe’s durability. The Nike Zoom Streak 6 is an exceptionally versatile racing flat. It has sufficient cushioning for long runs, and more than enough responsiveness for quick sessions or fartleks. The improvements in the last, the addition of the midfoot plate, and inner midfoot wrap, offer runners a more form-fitting fit and added spring. For those who plan to take the shoe for middle to long distance runs, there responsiveness of the Pebax plate and the Zoom air unit in the heel are just what the doctor ordered. I am here to review the Zoom Streak 6’s secure the heel and ankle in place which is important especially when you are doing faster stuff and every second counts. I have not used them too much yet, but one of the main things that I see in reviews on this shoe is that the durability of it is not very good. I haven’t experienced any problems with them yet, but am on the lookout for that potentially, but I think that this shoe is still a great racing flat since it has a lot of responsiveness in the sole of the shoe which makes you feel and run faster in my mind. I cannot say whether or not durability is a major issue, but it is something to be aware of if you are interested in this shoe model based on the sheer number of complaints about that issue. I think that durability shouldn't be an issue since the sole seems sturdy enough to handle many hard workouts and runs in them. The only place I could potentially see problems is in the upper mesh since it is thin there. I have not used these shoes for too long, but so far, the performance of these shoes has been up to my expectations. 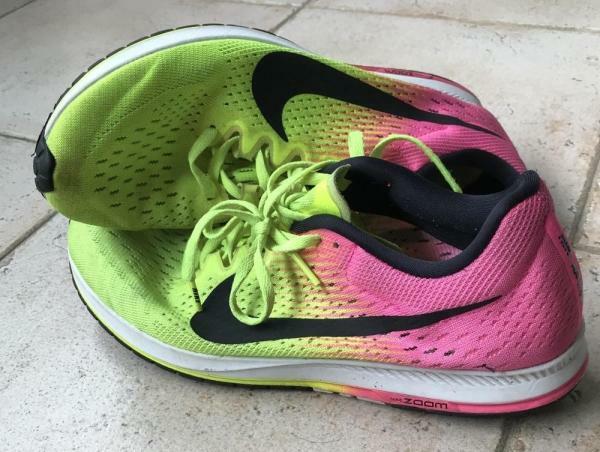 These shoes provided a quick ride that I would mainly consider to be a racing flat or for faster workout sessions since the durability of these shoes has been highly ridiculed by many others. In my mind, these Zoom Streak 6’s are a hybrid of a lightweight trainer and a typical racing flat. They offer the lightweight feel of a racing flat with the shoes weighing 6.80 ounces for a men’s US size 10 which is impressive in my mind and hopefully yours too. My initial thoughts on this shoe are that it would be a nice change in racing shoe since it allows for more cushioning instead of the minimal cushioning known to be a staple of racing flats. After testing it out in a 10k race over the 4th of July, it handled as well as I expected it to and it was everything I hoped for. A snappy, responsive racer that provides cushioning to help aid with the pounding that one’s legs take on race day or a hard workout day. I do want to say that I cannot definitively say whether or not the durability is an issue yet, but I feel comfortable with promoting them since they are unique racers. I am hoping to be able to use them more for faster workouts as well as for races in the future and I hope that this helped you all out. The racing flat designed for uptempo running. This shoe is purpose-built to be light and snappy and fast. The upper of the Zoom Streak 6 is a lightweight, almost 'less than there' mesh (see image below). The upper is airy and comfortable for my narrow foot but those with a larger foot volume are likely to feel the squeeze. The tongue is unpadded and made from the same mesh as the rest of the upper. The heel is lightly padded around the cuff and the heel counter is not as stiff as many other racing flats. Durability is my greatest concern with this upper. I have put a little less than 200 miles on this model and the mesh is starting to rip along the outside of the toe box. Many would say 200 miles is durable for a racing flat. Personally, I expect more miles out of mine. This sole fits similar to most racing flats. It is tight with a curved shaped. I have a narrower foot so the shoe works well for me. Those with a larger mid and/or forefoot may not enjoy the fit. However, the laces are long and this does provide a surprising amount of fit variability when compared to other racing flats. Nonetheless, the lightweight mesh makes this my shoe of choice during speed work and tempo runs on a hot summer day. This is a no-frill midsole. 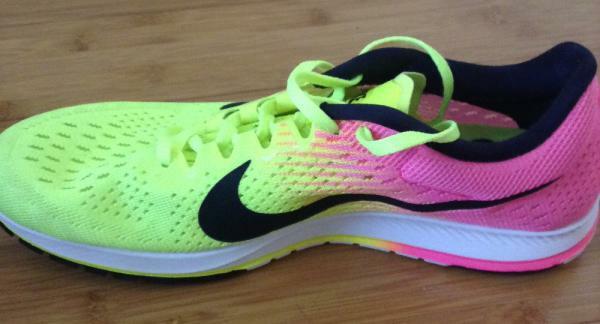 Again this shoe wants to be light and fast, at the expense of plush cushioning. The Zoom Streak 6 does provide some cushion, just not as much as you might want if you are expecting a daily trainer. I haven't taken the Zoom Streak 6 further than 13.1 miles, so I am not sure how the cushioning will hold up over longer distances. Although, many swear by them as their marathon race day shoe. My favorite aspect of this shoe is the plastic shank found in the mid-sole (pictured below). The yellow plastic shank is exposed within the sole. I'm not sure if this is a weight saving design or purely aesthetic. This feature provides a nice snappy feel during speed work and tempo runs. If you enjoy some ground feel yet still wants some responsiveness, this shoe provides plenty of that. The outsole has an interesting honeycomb-like pattern. This provides plenty of flexibility. The durability has been surprisingly good. Grip has performed well on all paved surfaces wet and dry alike. At about 200 miles the only sign of wear is on the outer toes. The Nike Zoom Streak 6 hits the mark as a responsive racing flat. Versatility though is lacking for me. I didn't enjoy running in Zoom Streak 6 any slower than at tempo pace. The well-cushioned racer that has made an impression. Performing well both on the track and the road, running in this shoe is both comfortable and enjoyable. One of the things that stood out the most when running in the shoe is the fit. In most racing flats like the New Balance 1600, the fit is traditionally narrow at the forefoot area, making it hard for my foot to move and occasionally leading to hotspots. One thing the Streak does well in this area is that due to the lack of welded overlays, the mesh upper is able to accommodate my feet with not much problem, giving the shoe a glove-like fit. One thing I must note is that I went half a size up from my foot size in order to give my midfoot a bit more room. The heel counter used on the Nike Streak 6 is another feature that I love about this shoe. Having a slightly smaller heel than what most people have, the heel counter fits surprisingly. In most shoes, there is usually too much room in the heel but the heel counter on this shoe fits like a glove. The lacing system used on the shoe is not traditionally seen on running shoes. The eyelets are not punched through the upper but instead, they are part of the mesh upper. Being part of the upper, tightening the laces gives the shoe a more secure fit than that in other shoes. The upper of the Streak 6 is very breathable and durable, being able to withstand round after round of abuse. When I started using the shoe the thin upper gave me the impression that I had to pamper the shoe with a lot of care. However, after using the shoe for a few months I saw that the upper was able to withstand beatings with little visible wear. One other thing the thin upper provided was breathability. I really got to see how breathable the upper was when I left the shoe in my bag for 3 days after a session in the rain. When I took the shoe out, I thought they were gone as they were still soaked but after drying them out for a couple hours they were bone dry and had no smell. As a racer, the Nike Zoom Streak 6 has held up quite well. After a season of using it as a track shoe and at competitions, outsole wear is minimal and there are very little signs of wear. The area where there is substantial wear is at the exposed midsole material. The Nike zoom air material used on the shoe provides it a very responsive and supportive feel. The toe off on the shoe is quick and the ride is very smooth. The addition of a Pebax plate in the midsole made the shoe a bit stiffer than usual. Once I got used to the added stiffness they became my go-to shoe for faster workouts on track. Also, the thicker midsole makes the shoe very comfortable to run in during longer runs while not adding any additional weight to the shoe. The Streak 6 is a beautiful shoe. Running in it gives me a feeling that I am running fast as it looks sweet. The design is simple yet elegant making it look very sleek. With no welded overlays the upper looks very clean which is what I want in my racers. The Nike Streak 6 is not a perfect shoe and one of the problems is the seams falling apart at the heel area. Although as stated above the upper is durable, this is kind of annoying as I have to cut the threads that come out. The Nike Streak 6 is a responsive racer for runners who wish to have a shoe that they can use for longer workouts. This shoe performs well both on the track and the road and has been my go-to racer for most of my races. This shoe is by far one of the best racers I have run in in a long time. All in all, it is not a very versatile shoe but the Nike streak 6 is a racer that does one thing very well - racing. The 400-mile workhorse flat "aka Nike Zoom Streak 6"
Marathon flats are a thing! For me, I call them the Nike Zoom Streak 6. This little workhorse became a PR shoe for me by accident. A flat is not for everyone when running a marathon but, I try so many things to determine if it is possible and successful. In 2016, I panicked when Saucony redesigned my favorite flat, the Saucony A6 and I could no longer find a flat to handle the marathon distance. I was headed into Marathon #9, and literally driving to various stores the week before the marathon. When training, I always wear a heavier shoe, and rarely run with my marathon shoe and usually have 4-5 different brands rotation. So this was going to be interesting. The Nike Zoom Streak 6 has become a go-to shoe since then. It is a unisex shoe, so it was weird when I first put it on. The shoe fits like a slipper. Very light and feels like it has no weight to it. The price point is very affordable at $110.00 a pair. However, I usually find them for $90.00. Each pair I own has over 300 miles, one at 400. I have three pairs still in a rotation but have bought six pairs of them since 2016. I am a sucker and refuse to throw them away. 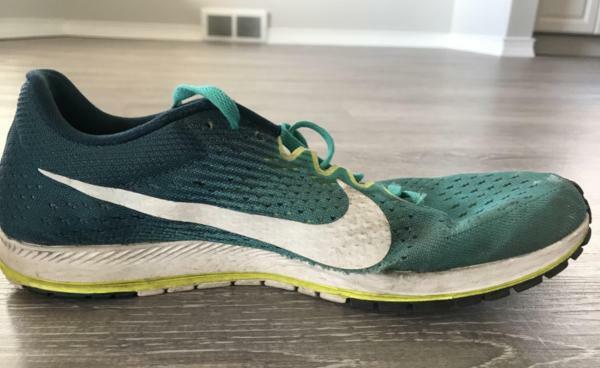 There are faster shoes out there which I have also tried in my rotation for racing, but they cost twice the amount, and the miles I get from the expensive shoes do not last over 300 miles. They are so expensive that I save them for “Special” races! The material as you can see in the photo is a lightweight, breathable mesh. I have never developed one blister wearing these flats. I wore this flat in the 2017 Boston Marathon. It poured the entire race, and while everything was wet, they did not weigh the shoe down at all. In my opinion, my feet obviously were wet, but because the mesh is so breathable the water did not collect in the shoe. During summer racing, my feet also never felt sweaty. The tongue of the shoe also is mesh, and there is an extra layer that is sewn into the shoe that is also part of the lacing system. I like this lacing system. I feel that it holds your foot in place and has minimal movement. The heal portion of the shoe is comfortable, and I never felt like it was slipping out of place. Because this shoe is flat, I asked myself how the ride was going to be especially for a marathon. It is not a zero drop, so I felt comfortable that it was still going to provide a good stride. There is no fluffy cloud-like bounce or spongy feeling that you will get the Hoka. However, the sole of the shoe is blown rubber. It has very good traction — the waffle-like pattern which in my opinion gives it a smooth ride. My cadence is 195-200 on a simple training run. I mention this because I believe it makes a difference when wearing this shoe. If you have a lower cadence you may feel the impact of the ground a bit more. The blown rubber does not wear out. The photo below is 400 miles plus. The photo with the 2 shoe types is the Nike Epic React and the Nike Zoom Streak 6. The Epic React only had less than 100 miles. My PR Marathon time is 3:24 which I ran with this flat. 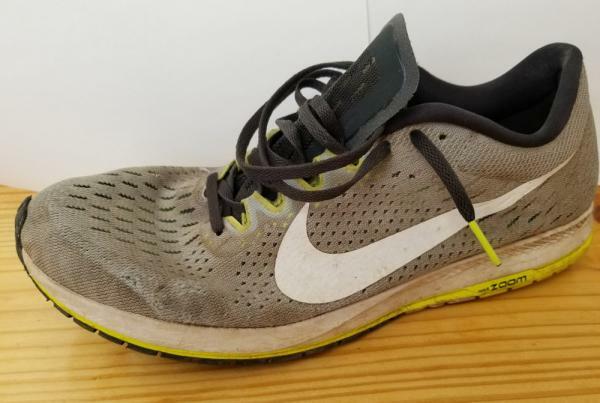 I have used this shoe in several marathons since then and raced 10 miles, 10k’s and 5k’s. I trusted them enough to run them in the New York Marathon, 2 Boston Marathons, and several other marathons. The courses all varied from flat, hilly, and even used them in an off-road. Even ran a trail 10k in them! I consider this an excellent choice shoe if you are not afraid to try a flat. I had doubt when I first put them and walked around in them. I wore them out of the box, but give them a few runs and compare them to other flats and you will end up keeping them as a rotation or a PR shoe. Nike unveiled several changes in the 6th iteration of the Zoom Streak. The most apparent change is the removal of the Flywire cables, after prototypes of the latest Streak model yielded mixed results from elite athletes. As a replacement of the Flywire cords, Nike uses an inner wrap around the midfoot to still provide that wraparound feel and security without the risks of blisters caused by too much pressure from the cords. The elimination of the cords also directed Nike to use the tried and tested Flymesh upper variety. It has excellent breathability while giving the shoe the right blend of support, security, and accommodating fit. Giving the Zoom Streak 6 more responsiveness is the result of a new midfoot plate. With this plate, there is much better torsional rigidity and provides a quick rebound from the compression on the midsole upon landing. The heel section gets a slight modification with the dismissal of the thick and stitched overlay. In its place is a welded and thinner overlay to lessen the stiffness in the heel. Finally, the outsole also offers considerable changes. The outsole is almost covered with hexagonal grooves for multi-directional traction. The new grooves enhance the grip of the shoe as opposed to the flatter outsole of the previous model. The fit of the Nike Zoom Streak 6 is slightly modified relative to the prior model. As the new model has a more anatomically-based last, there is more room in the forefoot for the toes to splay. The heel has excellent hold without being stiff while the midfoot remains as snug as ever. Runners with narrow to slightly wider feet should be able to get their most comfortable fit in this shoe. The sizing runs true in the latest model of the Streak. The outsole of the Streak 6 is mostly made of different-sized hexagon-like configurations with deep flex grooves for enhanced multi-directional traction and flexibility. Nike covers the heel with hard carbon rubber for durability while the rest of the underfoot is mostly blown rubber for better grip on different surfaces. A full-length Phylon foam, which is made of heated and then cooled EVA capsules, occupies the midsole. As this is slightly firmer than many of Nike’s midsole foams, the ride has a very noticeable zip all throughout. Giving runners more cushioning in the heel is an Air zoom unit, which also handles shock-absorbing duties of the Zoom Streak 6. New to the midsole is the Pebax plate that adds structure and rigidity to the shoe. It gives the shoe even more responsive and makes the transition quicker and more efficient. The upper of the Streak 6 is mostly made of Flymesh and welded overlays. Nike uses the Flymesh as it gives spot on support and flexibility to the runner. The breathability of the upper is also excellent. Giving the shoe a nice hold and security is a new inner arch strap. The more accommodating support of this design lessens the risks of blisters, particularly for those who go run hard and fast. Although the tongue is quite thin like most racers, it is made of plush material to prevent irritation. The ankle collar is adequately padded.